Egypt's army has plans to push Mohamed Mursi aside and suspend the constitution after an all but impossible ultimatum it has given the Islamist president expires in less than 24 hours, military sources told Reuters on Tuesday. 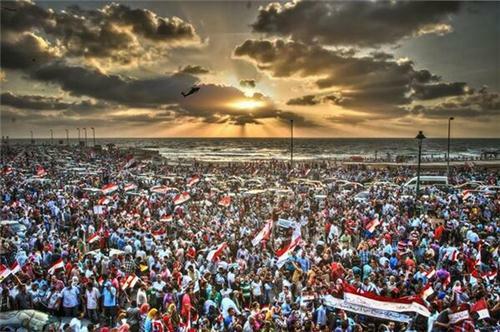 Condemning a coup against their first freely elected leader, tens of thousands of Mursi's Muslim Brotherhood supporters took to the streets, clashing with opponents in several towns. But they appeared to be dwarfed by anti-government protesters who turned out in their hundreds of thousands across the nation. Troops were on alert after warnings of a potential civil war. 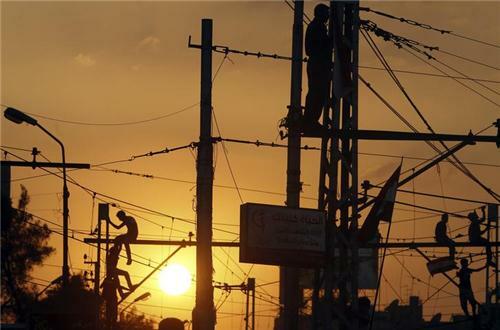 Seven people died in fighting in Cairo suburbs and hundreds were wounded in the provinces. Some women, carried on the shoulders of men, led chants with megaphones. Others led marches to Tahrir Square as they smacked wooden shoes in order to shoo away Mr. Morsi and the Muslim Brotherhood. Female artists also joined in the marches, including prominent Egyptian actress Maha Abo Ouf and female pop star Angham. Rights groups say around 46 women were sexually assaulted in Tahrir Square on Sunday. Read the full report by Reem Abdellatif here. Supporters of Egypt's Islamist President Mohammed Mursi have formed militias and say they're willing to die for him, says Eric Trager of the Washington Institute. He spoke to Reuters from Cairo's Tahrir Square. Army concern about the way President Mohamed Mursi was governing Egypt reached tipping point when the head of state attended a rally packed with hardline fellow Islamists calling for holy war in Syria, military sources said. Read the full story by Yasmine Saleh and Tom Perry here. READER QUESTION: What implications for conflict in Syria could be expected after presumed Morsi retreat? 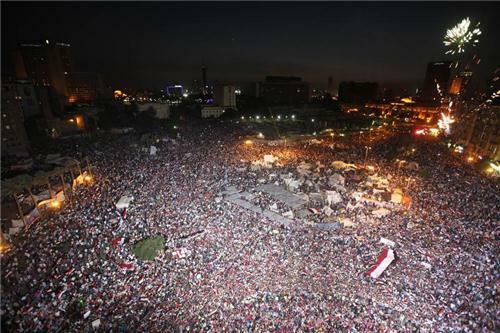 Readers: right now we are watching Tahrir Square in Cairo, Egypt. It is now after sunset. We may change the video stream -- we have multiple videos to record demonstrations. 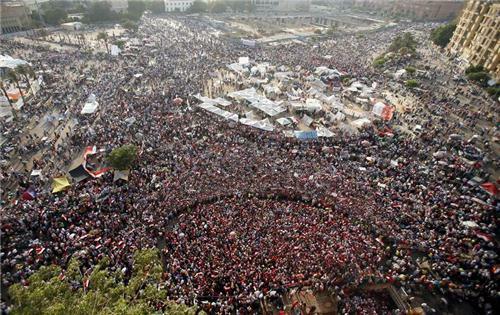 The demonstrations at Tahrir Square (as of this moment) are of an anti-Mursi sentiment. READER QUESTION: Where is Morsi's family, in Egypt? WASHINGTON, July 2 (Reuters) - Egypt's leaders must respect the views of the Egyptian people, U.S. Secretary of State John Kerry said in a call with Egypt's foreign minister on Tuesday, according to a State Department spokeswoman. During the call, Kerry told Mohamed Kamel Amr: "It is important to listen to the Egyptian people," State Department spokeswoman Jen Psaki told reporters in a briefing. "Democracy is about more than just elections. It's about ensuring that people can have their voices heard peacefully," Psaki added. 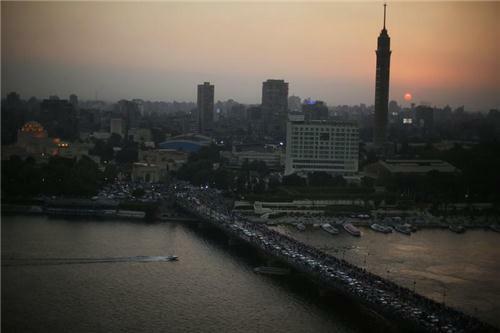 The call was made amid reports that Egypt's foreign minister had resigned. President Mohamed Mursi, Egypt's first freely elected leader, was clinging to power with tens of thousands of people on the streets of his country from rival factions. READER QUESTION: What are the green flashes and the popping sounds? Our live video feed is going back and forth between showing pro-Mursi and anti-Mursi protests. Readers, thank you for joining the Reuters live blog about world events. We are focusing on the events in Egypt this week, but you can bookmark this page and visit this live blog anytime. Do you have a question I can help answer? Feel free to submit a question (or comment) using the options above. Military helicopters fly above Tahrir Square while protesters opposing Egyptian President Mohamed Mursi shout slogans against him and Brotherhood members during a protest in Cairo July 1, 2013. CAIRO, July 2 (Reuters) - Egypt's armed forces would suspend the constitution and dissolve an Islamist-dominated parliament under a draft political roadmap to be pursued if Islamist President Mohamed Mursi and his opponents fail to reach a power-sharing agreement by Wednesday, military sources said. The sources told Reuters the Supreme Council of the Armed Forces (SCAF) was still discussing details of the plan, intended to resolve a political crisis that has brought millions of protesters into the streets. The roadmap could be changed based on political developments and consultations. Chief-of-staff General Abdel Fattah El-Sisi called in a statement on Monday for Mursi to agree within 48 hours on power-sharing with other political forces, saying the military would otherwise set out its own roadmap for the country's future. CAIRO - Egyptian troops chanted, marched and trained for unarmed combat in the streets of the Red Sea city of Suez at the mouth of the Suez Canal on Tuesday, images from Al Jazeera's Egypt news channel satellite showed. A day earlier, as the armed forces issued an ultimatum to the Islamist president and his opponents to resolve a political deadlock, rival factions exchanged fire in the city, witnesses said. Security sources in Suez said that forces from the locally based Third Field Army strengthened their presence in the city overnight after the clashes. Armed vehicles were also sent on patrol, the sources told Reuters. 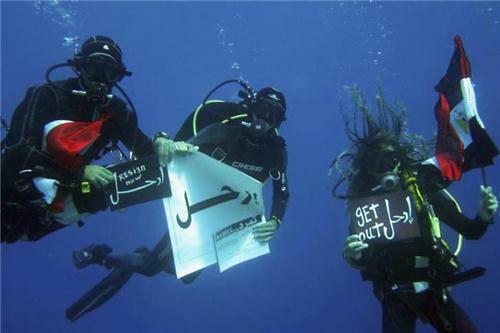 Egyptian officials have said security on the Suez Canal, the vital world waterway, had not been affected by unrest. 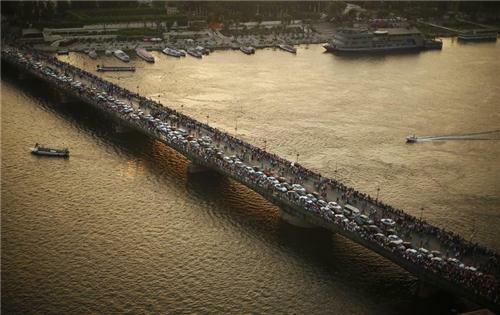 Cities on the canal have seen major anti-government protests during and since the revolution of 2011. Military sources said on Tuesday that troops were preparing to deploy on the streets of Cairo and other cities if necessary to prevent clashes between rival political factions. Egyptian Foreign Minister Mohamed Kamel Amr has tendered his resignation, the state news agency MENA reported early on Tuesday, after millions of Egyptians rallied against President Mohamed Mursi. Egyptian President Mohamed Mursi believes a statement by the head of the armed forces setting a deadline for politicians to forge a consensus risks causing confusion and will stick to his own plan for national reconciliation, his office said in a statement on Tuesday. Noting that Mursi was not consulted in advance by the general who made the announcement, the presidency said it "sees that some of the statements in it carry meanings that could cause confusion in the complex national environment". Egypt's main opposition bloc said on Monday an army statement which gave feuding politicians 48 hours to compromise did not reflect a desire by the military to take power. The ultimatum, which said the army would impose its own road map if the government and opposition failed to resolve the country's political crisis, showed that the army respected the "principles of democracy and the will of the nation as a source of power", the National Salvation Front said in a statement. 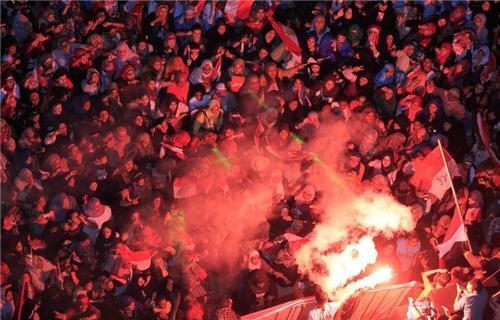 The group of liberals and leftists, which counts Nobel laureate Mohamed ElBaradei among its leaders, called on Egyptians to continue peaceful protests across the country. The Egyptian armed forces issued a statement on Monday denying that an earlier statement from its commander amounted to a military coup and said his aim was only to push politicians to reach consensus. Denying any political ambitions for itself, the military said it was responding to the "pulse of the Egyptian street" in issuing an ultimatum to political leaders to unite after mass rallies on Sunday against President Mohamed Mursi. 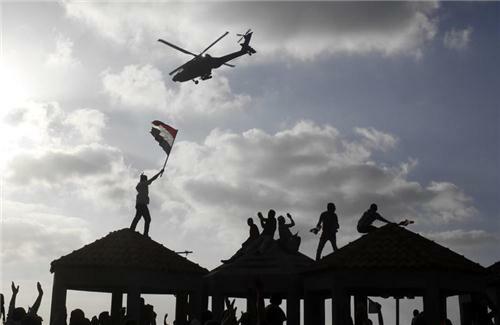 Egyptian military helicopters trailing national flags circled over Cairo on Monday after the armed forces gave politicians 48 hours to resolve a crisis over calls for the resignation of Islamist President Mohamed Mursi. It would deny [Mursi and his Islamist allies in the Muslim Brotherhood] the chance to govern Egypt that the Brotherhood had struggled 80 years to finally win, in democratic elections, only to see their prize snatched away after less than a year. - David D. Kirkpatrick, Kareem Fahim and Ben Hubbard for the New York Times. 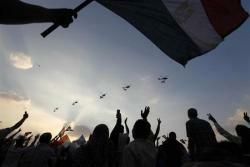 Egypt’s opposition plans massive rallies, South African protesters target Obama, and Syria peace talk date slips again. Today is Friday, June 28 – a good day to #FF @ReutersWorld – and this is the World Wrap, brought to you by @dwbronner and @clarerrrr. “Vigilance is required to ensure we do not slide into civil war,” the Al-Azhar institute said. In a statement broadly supportive of Islamist head of state Mohamed Mursi, it blamed “criminal gangs” who besieged mosques for street violence which the Brotherhood said has killed five supporters in a week… There was no immediate sign of trouble as Islamists gathered round a Cairo mosque after weekly prayers to show support for Mursi. His opponents hope millions will turn out on Sunday to demand new elections, a year to the day since he was sworn in as Egypt’s first freely elected leader. 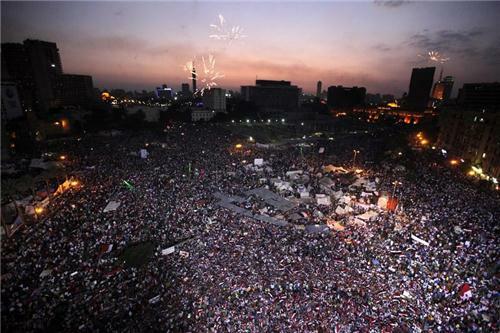 Opponents were unimpressed by Mursi’s hours-long, televised public address on Wednesday. Egypt’s opposition complains of economic stagnation, poor standards of living and accuses the ruling Muslim Brotherhood of imposing Islamic rule, while the Brotherhood paints some of its opponents as Mubarak loyalists. The Brotherhood blamed anti-Mursi activists for shooting one of its members dead overnight at a party office. 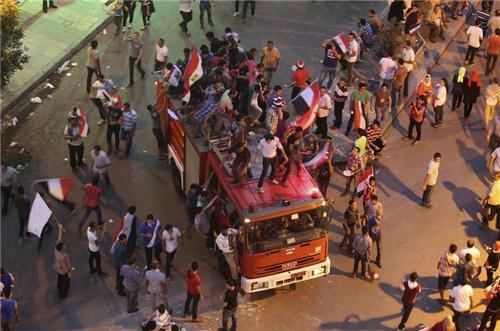 The military, which helped realize Mubarak’s ouster last year, is prepared to step in if the protests turn violent. REUTERS/Siphiwe Sibeko President Barack Obama in Pretoria, June 28, 2013.S.Protesters carry placards as they protest against the visit of U. 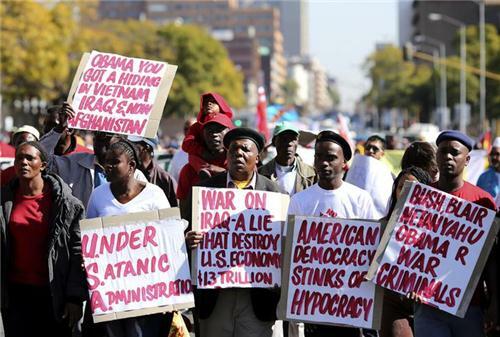 Nearly 1,000 trade unionists, Muslim activists and South African Communist Party members marched through the capital to the U.S. Embassy where they burned a U.S. flag in protest, calling Obama’s foreign policy “arrogant and oppressive”… South African critics of Obama have focused in particular on his support for U.S. drone strikes overseas, which they say have killed hundreds of innocent civilians, and his failure to fulfill a pledge to close the U.S. military detention center at Guantanamo Bay in Cuba housing terrorism suspects. White House officials said they will defer to Mandela’s family on whether to visit or not. On his first extended trip to the continent, Obama faces critics disappointed by his lack of interest in the region and a South African nation distracted by the failing health of a beloved leader. 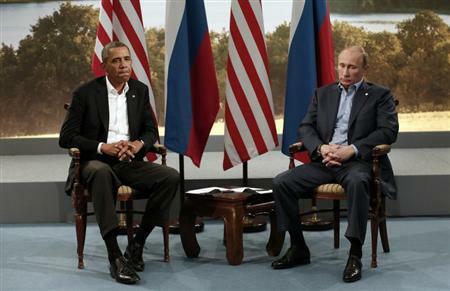 REUTERS/Kevin Lamarque President Barack Obama (L) meets with Russian President Vladimir Putin during the G8 Summit at Lough Erne in Enniskillen, Northern Ireland, June 17, 2013.S.U. Washington and Moscow have been trying since May to organize an international peace conference to bring an end to the violence. But hopes that such a conference will take place anytime soon – if at all – are fading quickly… The point of the conference was to revive a plan adopted last year in Geneva. At that time, Washington and Moscow agreed on the need for a transitional Syrian government, but left open the question of whether Assad could participate in the process. Assad’s forces captured a border town close to Lebanon this week as the Syrian Observatory for Human Rights, a pro-opposition monitoring group, reported the death toll in the two-year conflict has risen to over 100,000. Nota Bene: Iran signaled no change of course on its nuclear program, despite this month’s election of the relatively moderate candidate Hassan Rohani as president. Hacker fights for Islam worldwide from remote Mauritania. Bombs planted in police officer’s car kill at least 10 in western Iraq. Serbia gets the green light to start EU membership talks. Kurdish party calls for summer of protests to pressure Turkish government. U.S. cuts off trade benefits for Bangladesh in response to safety conditions.